Above all the cities offer a great variety of shops, markets and possibilities to go shopping. Regional, seasonal and fresh products directly from the producer. 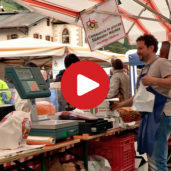 At the Lagundo farmers‘ market near Merano, farmers sell their products, such as fruit, vegetables, cheese and much more. We strolled across the farmers‘ market. Fresh fruits and vegetables straight from the farmer have a special value and offer more quality of life. 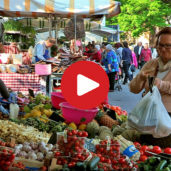 We look over the farmers’ shoulders and visit the farmers’ market in Merano. Join us today on a pleasant stroll through the market, on Market Day via Claudia Augusta in Lagundo! Leisurely see what the stands have to offer and enjoy the large variety of products on offer. This will be something you won‘t forget! 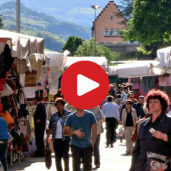 One of the most famous weekly markets of South Tyrol is the Friday’s market in Merano, a few steps away from the train station. Here can be found everything the heart desires: clothes and jewellery, fresh fruits and vegetables and all kinds of specialities of the region and Italy. Come with us and experience the tradition of the travelling market traders of South Tyrol. 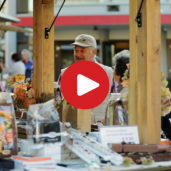 A special place for becoming familiar with country and its people are also the South Tyrolean markets. Not only in the centres, but also in smaller places stall-keepers offer their goods for sale. Housewives haggle for the best prize, others compare clothing and prizes or enjoy a fried chicken or a bratwurst. Open-minded, steeped in tradition and multi-cultural… just another face of South Tyrol. Shopping in South Tyrol is a real experience. This is where you can find anything your heart desires, from Italian fashion to traditional costumes. Ideal places for shopping tours are of course the cities, such as Merano, Bolzano, Bressanone and Brunico. In the centre of these cities, one shop is located next to the other. Shoes, sports equipment, evening dresses or umbrellas… the variety is inexhaustible! Those who are looking for typical South Tyrolean products such as speck or strudel will also find some shops offering local delicacies. Products coming directly from the farms, however, can be purchased at the farmers’ shops. 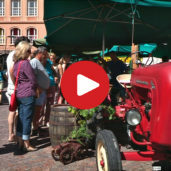 One of the largest farmers’ markets is offered at Bolzano, but also several villages offer markets of considerable size of this kind, such as Brunico. But you can also choose one of the weekly markets. Below you can find a selection. To those who are interested in a special topic such as leisure time, architecture or biologic products, we warmly recommend to visit one of the specialized fairs in the city of Bolzano. Markets are spread all over South Tyrol.